A new work researched and written to commemorate the First World War. World War One is in earnest and the death toll is mounting in Europe. Back home men and women work hard to keep the country fed and the guns well stocked, all the while missing their men who are away at the front. “While You Were Away” tells the local story of The Great War – the colourful characters who lived in Braintree and the surrounding area during this period and their experiences of war: The women providing their worth in Crittalls making shell cases for the army: the Vicar of Great Leighs meticulously keeping his daily war diary all the while helping the local population deal with the trials and worries of war. The small girl witnessing a Zeppelin raid on Braintree which wiped out a whole family while they slept in their beds not to mention the mother haunting Braintree station daily, desperately hoping for her missing son to return. There will be a special performance for schools on Thursday 13th November 2014. 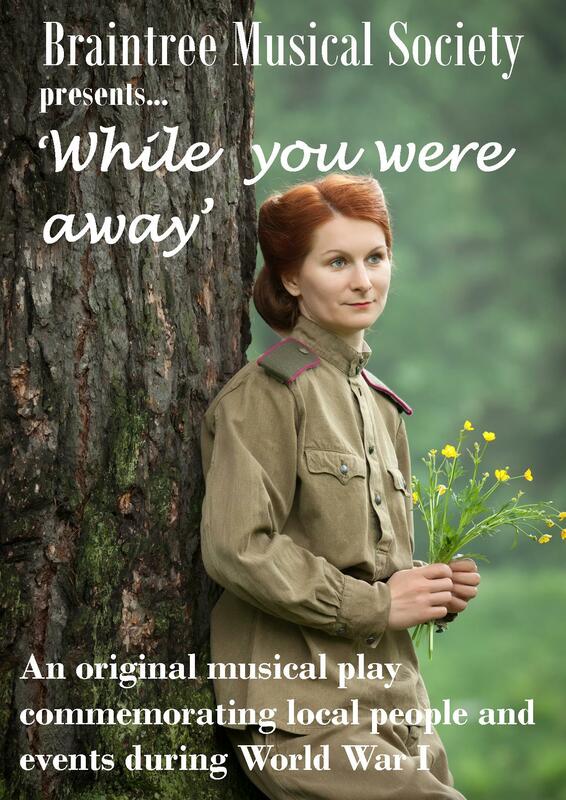 “While You Were Away” has been researched and written to commemorate the centenary of the First World War. The local archives have been delved into and BMS are very proud to be bringing real life characters back to life and honouring the vital contribution Braintree and its surrounding area made to the war effort. “While You were Away” cleverly entwines stories and music from the era, dramatising life as it was during the Great War – a production not to be missed.